Publisher: William Glaisher. No date. Probably between 1915-1925. Condition: Hardcover, decorative cloth. Gilt to top edge. Roughly cut pages. Foxing to edges, end papers and blank pages. Text very clean. The Confessions is an autobiographical book by Jean-Jacques Rousseau. In modern times, it is often published with the title The Confessions of Jean-Jacques Rousseau in order to distinguish it from Saint Augustine’s Confessions. Covering the first fifty-three years of Rousseau’s life, up to 1765, it was completed in 1769, but not published until 1782, four years after Rousseau’s death, even though Rousseau did read excerpts of his manuscript publicly at various salons and other meeting places. 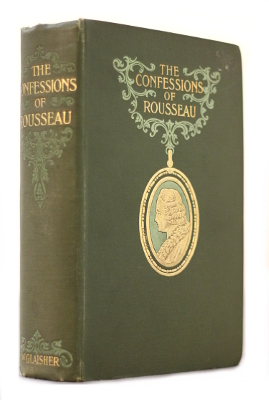 The Confessions is also noted for its detailed account of Rousseau’s more humiliating and shameful moments. For instance, Rousseau recounts an incident when, while a servant, he covered up his theft of a ribbon by framing a young girl — who was working in the house — for the crime. In addition, Rousseau explains the manner in which he disposes of his five children, whom he had out of wedlock with Thérèse Levasseur. In spite of its path-breaking features, Confessions is understood by Rousseau researchers to be a widely inaccurate autobiography. Jean-Jacques Rousseau (28 June 1712 – 2 July 1778) was a Genevan philosopher, writer, and composer of the 18th century. His political philosophy influenced the French Revolution as well as the overall development of modern political, sociological, and educational thought. Rousseau’s novel Émile, or On Education is a treatise on the education of the whole person for citizenship. His sentimental novel Julie, or the New Heloise was of importance to the development of pre-romanticism and romanticism in fiction. Rousseau’s autobiographical writings — his Confessions, which initiated the modern autobiography, and his Reveries of a Solitary Walker — exemplified the late 18th-century movement known as the Age of Sensibility, and featured an increased focus on subjectivity and introspection that later characterized modern writing. His Discourse on the Origin of Inequality and his On the Social Contract are cornerstones in modern political and social thought. He argued that private property was conventional and the beginning of true civil society.